Philadelphia's Washington Square, a shaded 6.6-acre plot near the nation's birthplace at Independence Hall, has been a focal point of the city's history for more than 300 years. 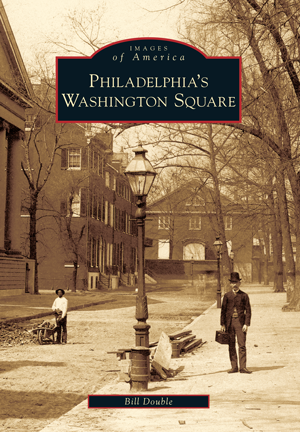 Designated by William Penn in 1683 as an open space, the square served as a potter's field for its first 100 years. The remains of more than 2,000 indigents, soldiers, and yellow fever victims rest beneath its sod. By 1825, the graveyard was closed and the square was redesigned as a public promenade. Rude huts on its periphery gave way to fashionable middle-class homes. Washington Square became a destination for publishing and advertising, home to the likes of J. B. Lippincott, W. B. Saunders, Curtis Publishing Company, Farm Journal, and advertising giant N. W. Ayer. In the 1950s, its Society Hill neighborhood was restored, and a memorial to the unknown soldier of the American Revolution was dedicated in the square. Today the square is again attracting the affluent with condominiums in its converted publishing houses. Bill Double, a freelance writer, is enjoying retirement by volunteering with the National Park Service and exploring the streets of Philadelphia.